Day 2 of the sports meet at Bennett University was marked by athletics and fun. BU sports houses took on each other in different qualifying events. The focus was on testing the agility of the participants through various physical activities. 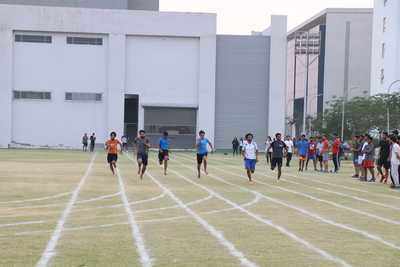 Students participated in different track races including 100m, 200m, 400m and 4x100m relay. Sports house Mighty Boltz performed well in many events and ended the day with most number of players qualifying for the finals. However, other houses also made their presence felt by qualifying for some of the events. Seeing his house performing well, Sri Krishna Kaashyap, B.Tech 3 rd Year and Mighty Boltz captain, said that the house should maintain its position and continue to do well. “It is good to see Boltz perform extremely well in the meet. We should continue the momentum into the finals,” Kaashyap said. In the discus throw event, Heroic Hearts’ Sadaf Sheikh along with Kalyani Roy and Siva Parvarthi of Mighty Boltz made it to the women’s finals. In shotput, Pushker Singh and Kasarla Reddy of Mighty Boltz booked spots in the finals with Aryan Goel from Super Spades filling the last spot. “I believe this is the sum total of all the efforts that the organisers, coaches and players have put in. There is a lot of enthusiasm and we hope to carry this forward to more such events,” said Sanidhya Sharma, BBA 2 nd year student and Sports Committee member.